Welcome to a new and innovative type of Bass Club. We strive to have as much fun fishing as we possibly can while still being competitive. Our Youth Club is designed to allow our future anglers an opportunity to go Bass Fishing, all the while learning to improve their skills as Future Anglers. Our next meeting is not scheduled yet, watch the web site for information later. We are currently looking for a new location to hold our meetings..
We meet the third TUESDAY of each month.. We will start at 7 pm and finish up at 9 pm Other club Members and all High School club members are welcome to come out and sit it. We encourage all of our youth members to attend. Remember, one of the requirements you are required to make is at least 2 of the 5 meetings, to meet your 25% minimum requirement to fish the Junior Bassmaster State Championship. We do not have and additional Adult club meetings scheduled at this point. We usually don't meet during the tournament season other than after each tournament to talk about current business. Watch here for more information and any important news later. Anyone is welcome to contact us if you are interested in checking out our club, we will provide you with everything you need to know. New Members are welcome to contact us about joining or for more information. We have set the preliminary schedule for the 2018 season. This year, we are doing two up north tournaments and several locals. Most of the lakes have maps available, if you click on the lake names you can see and even print them. Ryan managed to catch 3 bass on a very tough day on Kent Lake at the 2017 Club Classic. This is Ryans very first win during a club classic. Senkos and topwater got the job done for him. Congratulations on a job well done!! 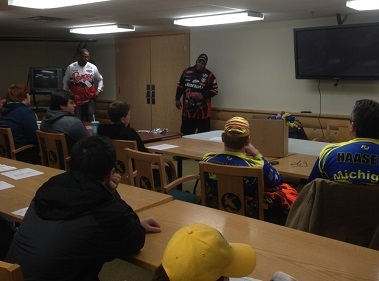 Local Pro Angler Devon Banks came out to our February Junior Bassmaster meeting and provided a great semiar. Devon showed the boys what being a pro is all about. He covered topics such as how to get and retain sponsors, social media exposure, types of baits that have been sucessful for him and how to prepare for tournaments. There were lost of questions from the boys. Devon did a great job. Marcel Veenstra put on yet another great seminar for our Youth club and some adult club members. The seminar was hosted by the Northfield Township Fire Department in Whitmore Lake. 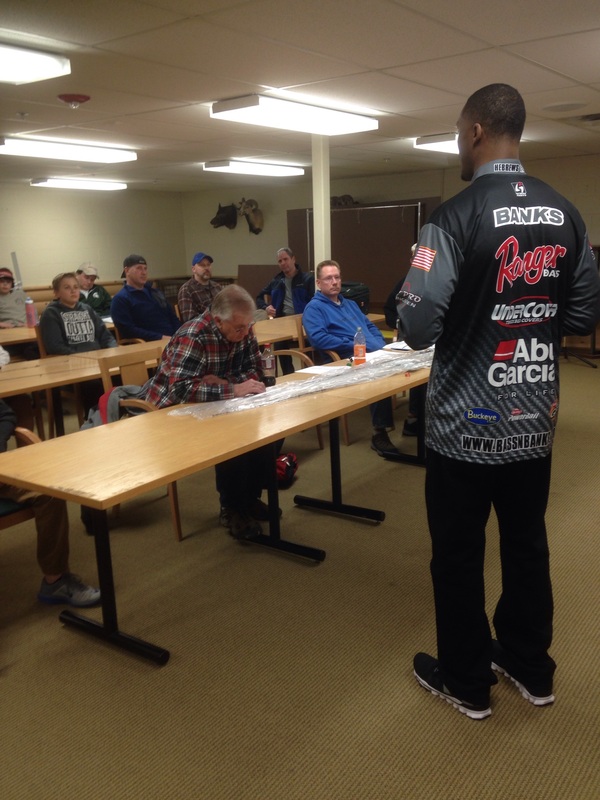 Marcel spent over two hours answering questions, showing the group the latest baits and talking about his 2014 season on Lake St. Clair. He gave the boys tips on the newest baits as well as some old stand byes. He talked about how to approach inland lakes and how to dissect them for tournament day. Marcel always does a great job. If you ever need a great guide for many of the inland lakes or most of the Great Lakes, contact Marcel. 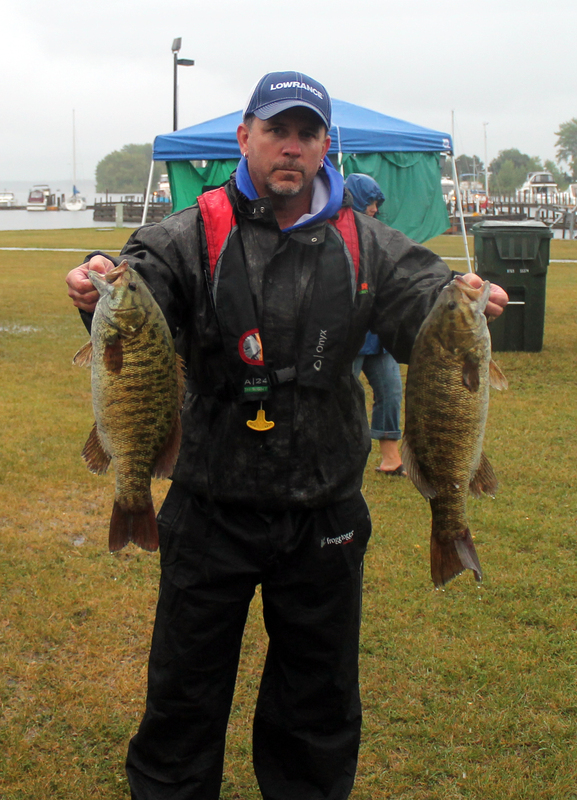 The 2014 Michigan Bass Angles Club Classic was a really tough tournament. We fished the Portage Chain of Lakes on a brisk Sunday the first weekend of October this year. The weather had changed and the bite got tough. Only 5 keepers were brought to the scales between the 5 top anglers. Dan Wagner took the honors with a total of 3.27 pounds for his two fish. 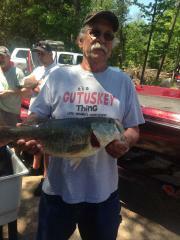 Dave Gutuskey brought in two keepers for 2.89 pounds. Gary Emerson managed one keeper for 1.53 pounds. Brian Lobkovich, a prospective new member fished the tournament as a Marshall and managed to bring in 3.73 pounds with two fish. Tyler Leggat, a MBA Junior Bassmaster who was also fishing as a Marshal, brought in one fish for 1.64 pounds. Everyone is really looking forward to the 2015 season and hoping things pick up. 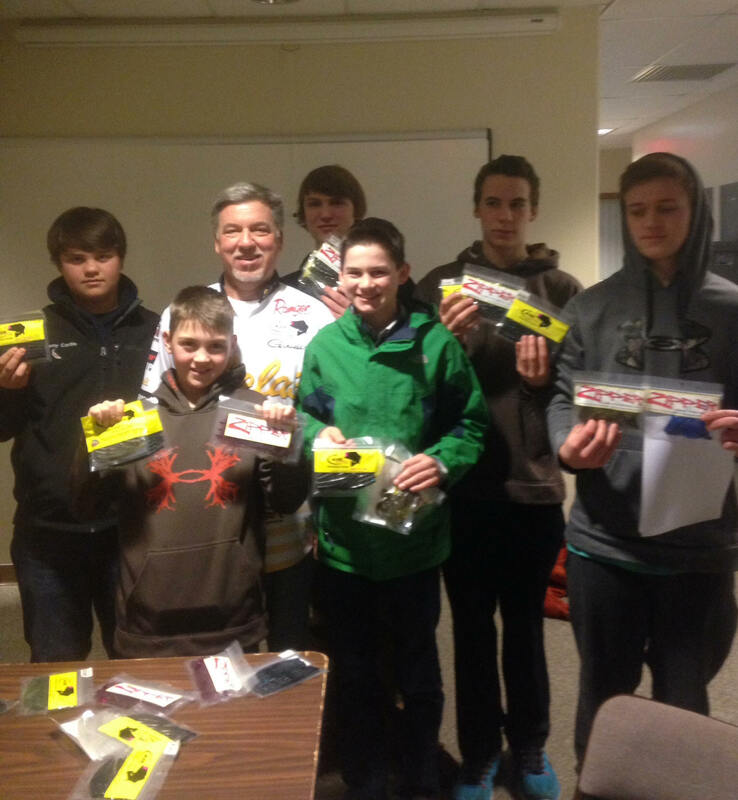 We had a great seminar at the January 2014 Junior Bassmaster meeting. Turnout was great. Devon and Michael both discussed tournament fishing, sponsorship opportunities, fishing Lake St. Clair as well as several other great topics. Devon and Michael are both local pros who fish a lot of the national level tournament like FLW and Bass Pro Shop. The guys opened up and answered questions our JBM's had for them. There were no limits. We want to thank them both for taking the time to come out and share their vast experiences with everyone. Go to Devon's web site at http://bassnbanks.com/. to see what he is all about. 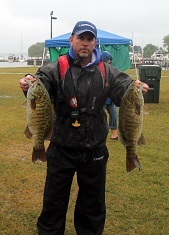 Victor Cole, one of our newest club members recently fished the 2013 Michigan B.A.S.S. Nation State Championship in Escanaba and managed to place in respectable 6th place to make the 2014 State Team. This was Victors very first Michigan State Championship tournament as a Michigan Bass Anglers club member. 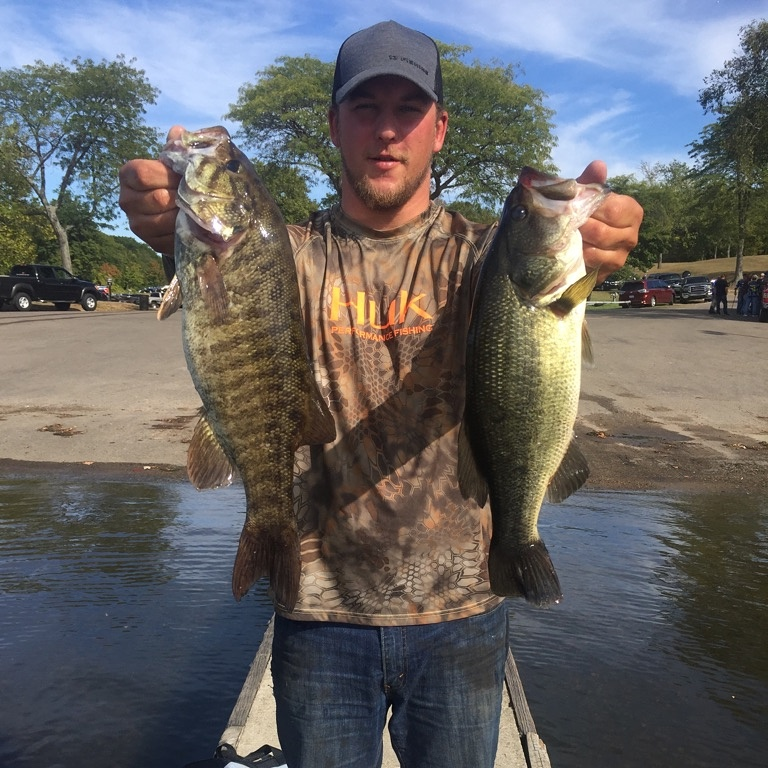 During the two day competition, Victor brought in a nice 31.25 pounds of smallmouth bass with the largest bass of the two day event at 5.99 pounds. We are very proud of Victor and look forward to him fishing the Northern Divisional in 2014. Victor should be proud of himself. We had a first for the club recently. At the request of several of our Junior Junior members, which are the 5-10 year olds, we held an "all fish" tournament on Kent Lake on Saturday May 11th. All of our little guys showed up all decked out in the new Michigan Bass Anglers club shirts and fished out of our club boats in a 3 hour tournament. They were allowed to use any baits they wanted including live bait, to try to catch either Bass for a Bass Tournament or Panfish for a Panfish tournament. You could feel the excitement at launch. The bass were tallied on our club Golden Rule tournament sheets while they simply had to keep track of how many panfish they caught all day. A total of 5 club boats helped out. The boaters were allowed to help out the Junior anglers any way they wanted, the kids just needed to be involved in some way in the fish catch. That included help reel the fish in after the boater or parent set the hook. The whole idea was to get the young anglers out on the water and expose them to the tournament fishing experience. They all had a great time. The boys even managed to have a bunch of energy afterwards to run and play in the park. A perk after the tournament was a picnic lunch we had for everyone. We had chicken, chips and pop after we came in off the lake. In all the tournament was a huge success. The parents seemed to enjoy the day was well. This was a perfect example of how much interest the younger kids have in fishing and the sport in general. 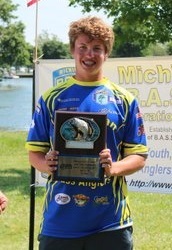 Michigan Bass Angler, Junior club member, takes 2nd place in Lake St Clair Walleye Association April Derby. Joey Elliott, a Junior Michigan Bass Anglers Youth club member, caught a 19 3/4 walleye, to beat his brother Davy, 18 1/2 inch to take second place on their new Triton boat, from D and R Sports. First, place was 20 1/2 inches. The boys won a new fishing rod, two fillet knifes, fishing line, and soft plastic baits. The fish was caught jigging in the Detroit River, with over 40 boats in sight on a sunny Sunday morning. It is very obvious that fishing is in his blood. 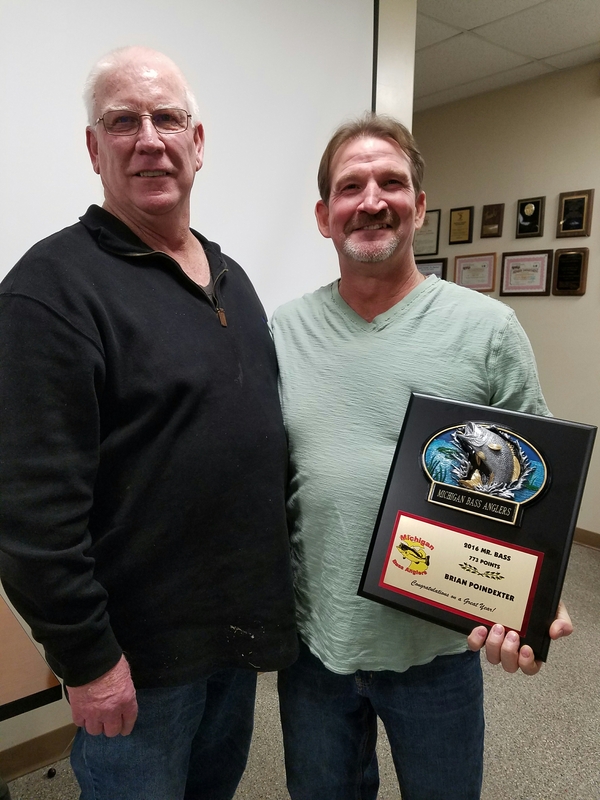 This years Michigan Bass Anglers Banquet and Awards dinner was a big success. We had around 60 people at the banquet .We did a pot luck dinner again this year and we had food galore. Everyone brought a dish to pass. All of our Youth Club members got their trophies as did the top finishers in Angler of the Year and Mr. Bass in the adult club. We also handed out Certificates to all of our "Junior" Junior Angles for helping out at various evnets this past season. We also handed out lots of fishing baits and other prizes to all of the kids. The Junior Anglers of the year were also awarded a nice Oakley/Quantum Fishing rod for their efforts. We would like to thank the Northfield Township Fire Department for providing their training room for the event. Our Club is currently recruiting new members, especially boaters. If you are looking for a club that is a lot of fun and easy going and one that will help you learn a lot about bass fishing, especially if you have never been in a Bass Club Before, we may be your club!! Just Click on the Facebook Logo... Club Members can now use our Team App. For more information and to go to their web sites, just click on their logo above. Please help support our sponsors. CLICK HERE to see the tournament report for the day. Bass Pro Shops, on Saturday March 24th at 4:00 pm.